I have been looking for a new bike bag and I came across the Superdry Japanese clothing company this week while web surfing. Turns out there is a huge store recently opened on Regents Street in the West End. I love this bag. It is sturdy, not too big, a wide strap for carrying over the shoulder a good deep pocket on the outside and one on the inside. It comes in lots of colour combinations just like Bromptons. Oh yes, it is vinyl and would stand a good shower, but not a heavy downpour for a long time, despite the name. Best of all at £39.99 it is cheaper than a bike messenger bag. I think I am moving away from traditional bike messenger bags for now. I end up carrying too much stuff and weighing myself down. I have been using my Brompton pannier a lot this year but again this is a very large bag and I would prefer to just keep it for shopping. I have thought again about the Ortileb Brompton bags but I find the high price off putting because I like to change my bags so often. (Just like my footwear.) I don’t want to pay that much for a bag that I know I will not be using in a year’s time. Nice, but Superdry are as Japanese as your Brompton. If memory serves, they come from Luton or some such! I too was eyeing the Ortlieb bags, specifically the white Mini-O bag, just for day tripping when I don't want to take much with me, but they are crazily expensive. Where I am, the Mini-O costs EUR 140! Congrats on your new bag. Nice when these little things can make us happy. 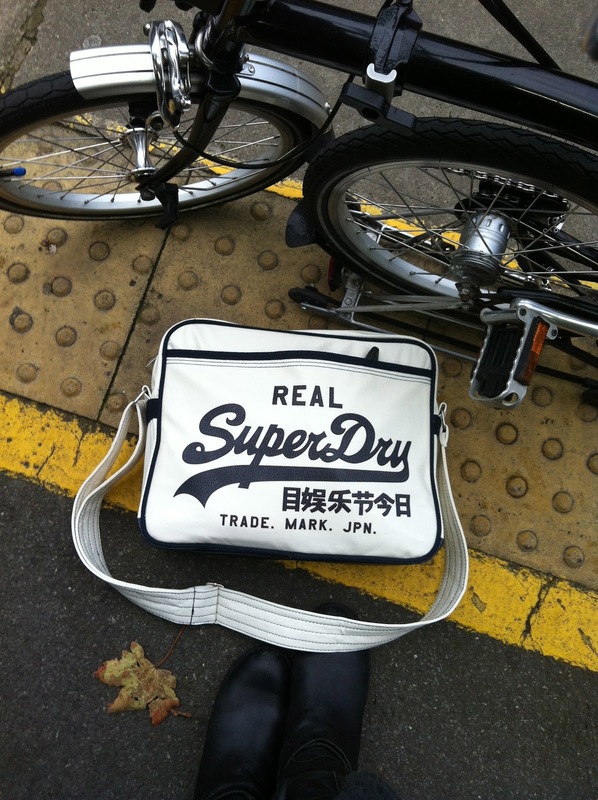 Superdry just brand name of bloke's market stand in Nottingham.Same bloke who set up Bench.Clever brand-marketing though.Ganbatte Igirisu-no -baka tachi! Everywhere I go I see these Superdry people i.e. they are wearing black (waterproof?) jackets. The jackets really have caught on and until I saw your blog entry this evening Grace, I had noooo idea they made other products. I have the Brompton C bag and love it, it carries all my stuff I need for a day trip like today I took the train to Christchurch in Dorset and cycled on the Bromp to Sandbanks, took the chain ferry over to Studland then cycled down to Knoll beach and rode/walked back along the beach to the ferry and to Christchurch for my homeward journey. My total mileage today was 30 miles and only possible because of my new Brooks B17 aged leather saddle. It's amazingly comfortable. On my travels today, I passed a mature gentleman with a white beard, on a lovely all-red Brompton. I nodded and smiled as we passed. It feels like I belong to an exclusive club. He smiled back, the knowing smile of the pleasure a Brompton gives us. Anyway, sorry, I digress, back to bags. I will never wear a backpack again whilst cycling. Getting hot and sweaty is really horrid. I must stay cool. I followed your link to your report on the T bag. Oh my, I never knew it carried so much. I might need one of these if I go touring. I also love the Carradice Camper Longflap saddlebag http://www.carradice.co.uk/index.php?page_id=product&product_id=35&under which I am also considering. I would need the quick release for it though. If I had the quick release it would mean the Brompton seatpost would not retract fully and may lead the bike to unfold when not needing it to so I may need to get the extended seatpost. Reminds me of a pouch my dad used to carry, for carrying valuables. Nice color and a retro touch. I loves this bag, I also want this. I went round and round about what bag to get for my Brompton, which is supposed to arrive at the end of this month (15 week turn around time if ordering in the U.S.!). I am pretty settled on the Carradice bag in olive because it looks very roomy and smart looking. I would have sprung for the pricey O-bag but black just soaks in heat and Arizona is hot enough. The hot pink color is just not me in any way. I'm also thinking about the Brompton S bag but who knows. I think the decision will happen once my bike arrives. 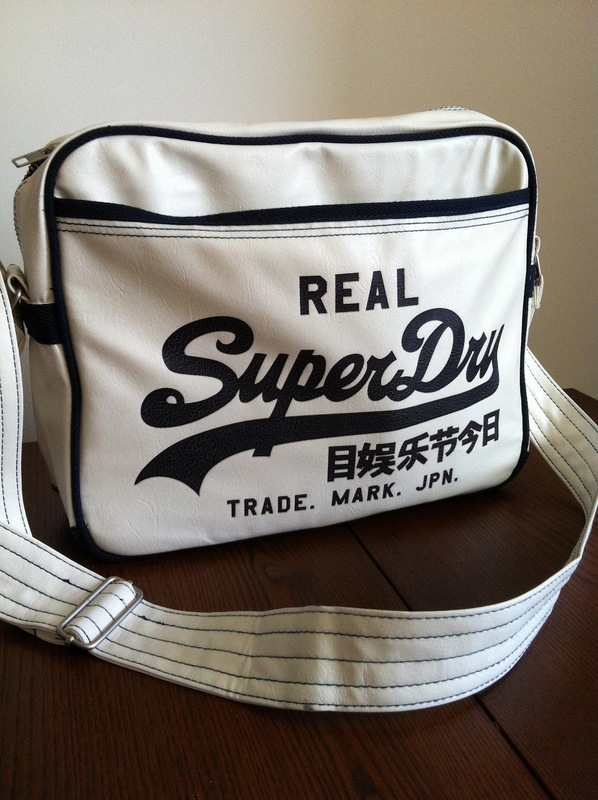 And the Superdry bag is super cool. I agree, wait until the bike arrives and then see what suits you best.